''I tried to create something that conveys the significance of the project and is a bit unsettling at the same time,'' says sculptor Bernard Brandi (right, next to Joseph Pilati and Jean-Philippe Cros). On Wednesday, 17 November, the ITER Headquarters' First Stone will be laid by Academician Velikhov and Prof. Motojima, in the presence of all the Heads of Delegation to the ITER Council. 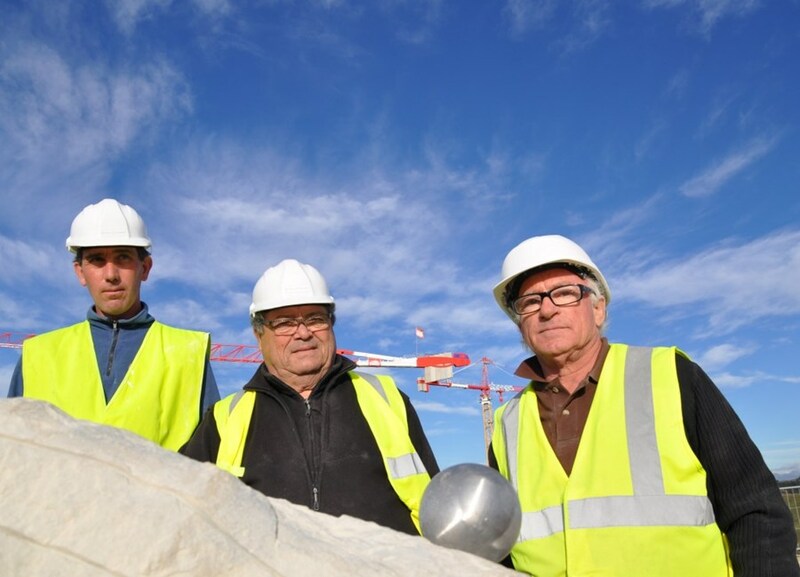 On the platform overlooking the future Headquarters worksite, the stone—quite a large chunk of rock actually—is being prepared by Marseille sculptor Bernard Brandi and stone carvers from Entreprise Pilati, also from Marseille. The 2.5-tonne rock, which comes from the depths of the Tokamak Pit, will be placed in the entrance hall, or in the nearby gardens of the future building, bearing witness to that day in mid-November 2010 when the first of the ITER buildings symbolically came into existence. Bernard Brandi, who specializes in creating public monuments, has created a strange and futuristic work of art that carries the symbols of what ITER is about. Of course we will say no more, so that the unveiling of the First Stone, on Wednesday, comes as a surprise to everyone. "I tried to do something dynamic," says the artist. "I used different materials in order to create something that conveys the significance of the project and is a bit unsettling at the same time." We will know on Wednesday if the artist has succeeded in capturing in stone the "spirit of ITER."